The MCP42010 is a dual-channel, 8-bit digital potentiometer features 10kΩ end-to-end resistance value with an SPI serial interface. The wiper position varies linearly and is controlled via the SPI interface. 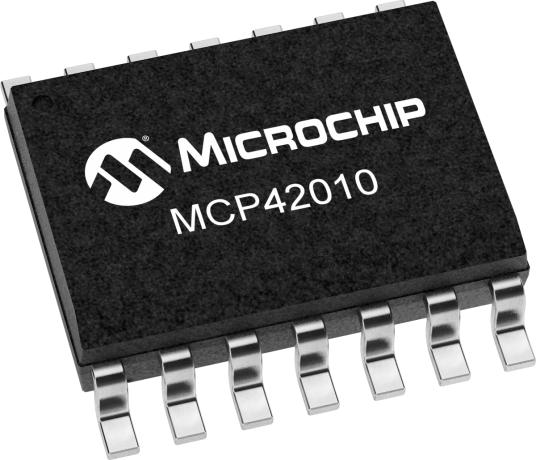 The MCP42010 has outstanding AC and DC characteristics, and consumes <1 µA during static operation. Applications for the MCP42010 digital potentiometer include audio equipment (volume and tone controls), servo-motor control, battery charging and control, communications (line impedance matching), power supplies, instrumentation (gain, offset adjust), LCD contrast control and programmable filters. The MCP42010 is available in 8-pin PDIP and SOIC packages.